#25 & #26: Pikachu and Raichu! | Gotta Bake 'Em All! 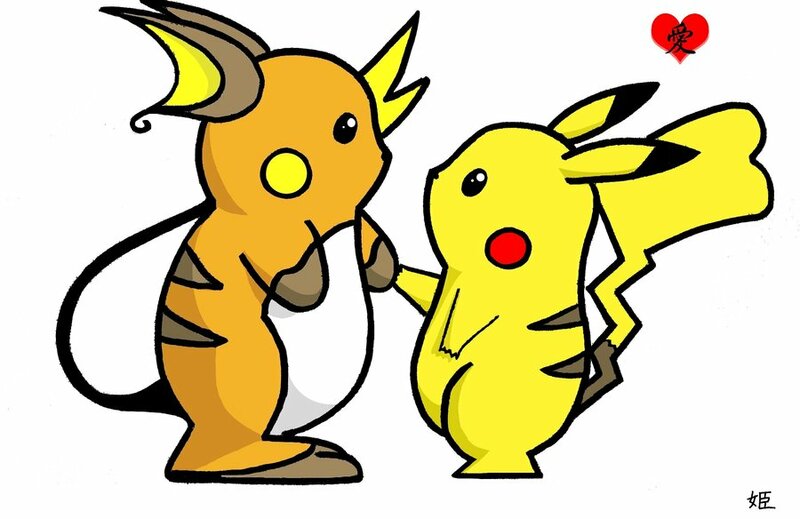 #25 & #26: Pikachu and Raichu! We’re finally back from our Christmas bake-cation and ready to continue supplying the world with tasty Pokémon inspired treats. We’re picking up where we left off numerically, and what better way to start the New Year with a spark than with the most iconic Pokémon; Pikachu and Raichu! Pikachu has long been the face of Nintendo and has already been enshrined in everything from cupcakes to toothbrush holders, so we wanted to do something a little different to represent the electric mouse duo. 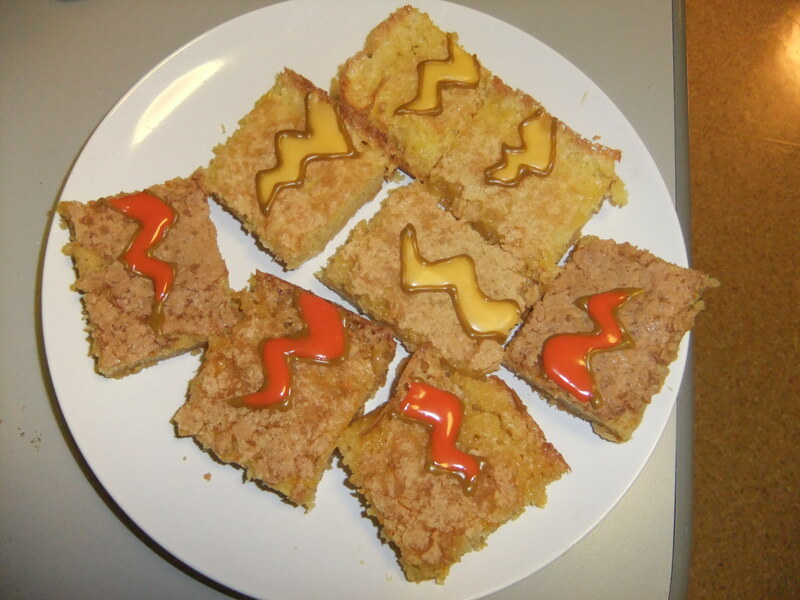 We felt their electric type was best captured by tangy citrus fruits, so we made lemon bars for Pikachu and lemon & orange bars for Raichu. It’s a pretty straightforward recipe and the end results are very tasty so you have no excuse not to try it (well unless you’re weird and don’t like lemons…)! 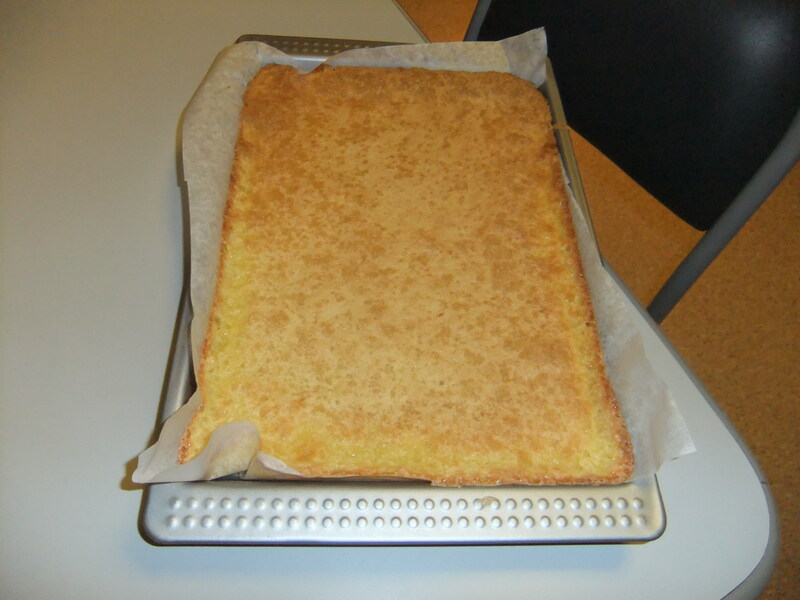 These are traybakes so we made 2 trays, one for Pikachu and one for Raichu, if you don’t think you’ll need that many lemon/orange bars you may opt to just make one or to find smaller trays (standard is 9″ by 13″). When finished we iced the bars with Pikachu & Raichu coloured lightning bolts in lemon glacé icing; if you’re a stickler for having your Pokémon inspired treats Look like the ‘mon then feel free to ice on a Pikachu or Raichu instead but this will take a long time and a lot of patience, especially to do ones that small! Be creative though, we like that. Anyways, Pikachu, Raichu- I choose you! This is how your base should look like when it’s all mixed up; kinda like crumbs! This is how your lemon/orange topping should look before you pour it on your base. Pre-heat oven to 165°C and line the baking tray with baking parchment. Chop 1 batch worth of butter into small chunks and either blend it in a food processor (preferred option) or whisk it until it’s soft if you have an electric whisk. If you have neither, just throw it into a bowl. 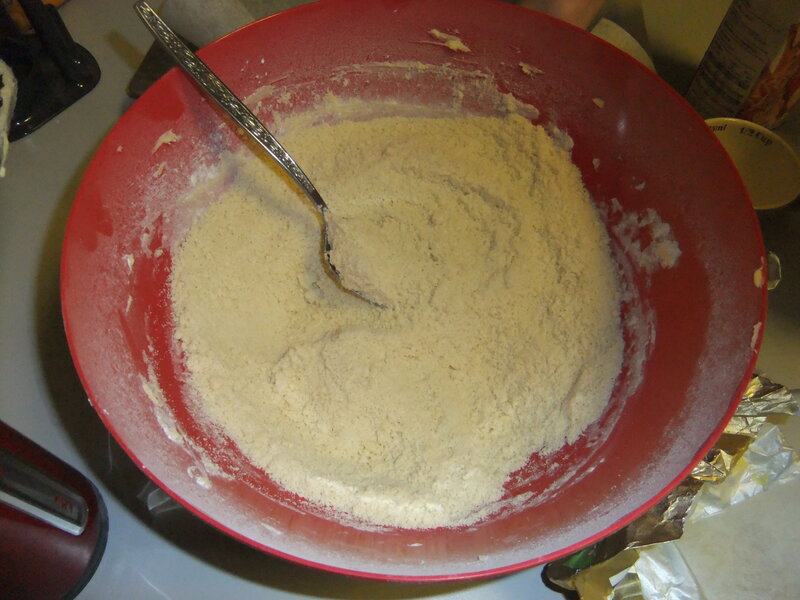 Add one batch worth flour and icing sugar into the food processor, or sieve it into the bowl with the butter. Either blend it in the food processor or whisk it until a fine crumb is formed. If you don’t have either a food processor or a whisk, ‘crumb’ the ingredients by rubbing it repeatedly through your fingers. Press the mixture into the baking tray and bake for 15 minutes. Mix one batch worth of the eggs, sugar, and baking powder in a bowl with 4 tbsp of lemon juice and 2 tsp of the lemon juice. Pour this mixture over the baked crust after the 15 minutes. Wait for ages for it to fully cool. Cut and remove from the tray. Repeat for the second batch worth of ingredients, using the remaining lemon juice and rind as well as the orange juice and rind in place of the lemon bits. Sieve the icing sugar and add in the lemon juice. Separate into three bowls and add yellow food dye to one bowl, orange, or yellow and red to the second and brown to the third. Mix in well. 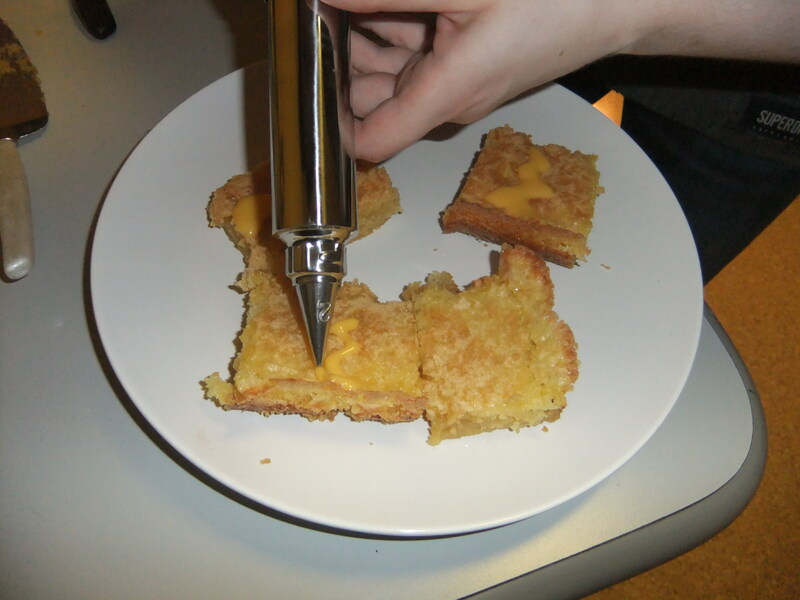 Transfer to some icing apparatus (icing syringe/bag) with a small, round tip (no. 1 or no. 2). Ice whatever kind of design you want onto the tray bakes. We did yellow and orange lightning bolts with brown outlines. The next step is to nom nom nom nom nom! We hope you like this yummy citrus recipe, we think they’re faaaabulous! We’ll be back to our weekly routine now so make sure to get back into the habit of checking back here regularly 😉 That’s all for now though, thanks for reading! 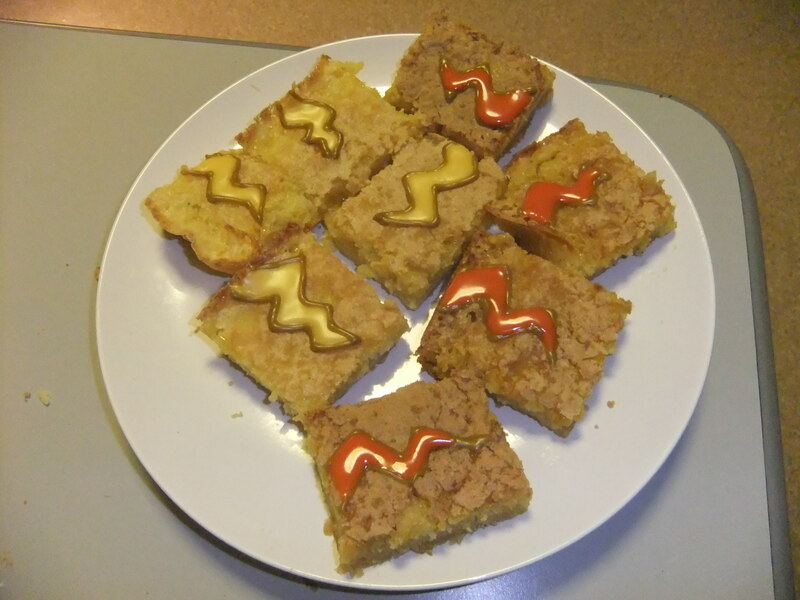 Enter your email address and we'll let you know when tasty Pokémon recipes get published. All recipes are created & owned by the authors. The authors claim no ownership to Pokémon, including any images or names of Pokémon used in this blog. Pokémon is a registered trademark of Nintendo.